Skiers gather on the deck of Cirque Bar & Grill in Snowmass Village in late February. 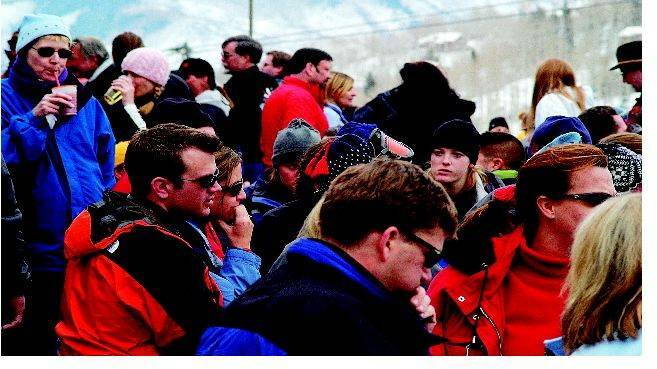 Between 15 and 20 percent of Aspen Skiing Co. visitors are foreigners. Aspen Times photo/Mark Fox. Utah may brag of having the “greatest snow on Earth,” but Aspen’s snow enjoys an Earth-wide reputation, according to a sampling of international guests The Aspen Times talked with in the past couple of weeks.Snow quality was the top reason international guests gave for coming to Aspen. “Der schnee!” the Germans said enthusiastically. “Champagne powder,” others carefully pronounced.”We heard about the best snow on earth,” said Dirk Winkler of Dresden, Germany, here on a weeklong vacation with a group of nine German friends. The group first tried Canada, but are now on their fifth Aspen vacation. Great, consistent snow may be the highlight, but it’s not the only reason people from around the world come to Aspen. In fact, it’s the whole package offered by Aspen/Snowmass that many international guests find attractive. The name “Aspen” is recognized worldwide, for starters, and for sophisticated urbanites from international destinations, here is a worldly small town with fine dining and culture, combined with a rugged mountain experience.Many international visitors are intrigued by Aspen’s name and reputation, and want to see it for themselves. They’ve often heard about it from friends who have visited, and those who come once often return.For Europeans, lift lines in the States are not nearly as crowded and unorganized as they are in the Alps or other European resorts. And, believe it or not, Aspen is actually a good deal for some Europeans, thanks to the weak dollar. Plus, many Brits say Aspen is less expensive than resorts in their back yard, regardless of exchange rates.South Americans like the high-speed lifts and the quality of the grooming, two things that are generally absent in Chilean and Argentine resorts. Plus our winter is their summer, so avid skiers must head to the Northern Hemisphere, and Europe is farther and more expensive. Aspen also appeals to people with varied interests.Rosario Huhm and her husband, of Nuevo Laredo, Mexico, have been coming to Aspen every winter for the past 10 years. “My husband likes very much to ski,” she said. “But no, not me. Shopping and dinner, oh, I love that here!”Most international guests hardly mentioned expense or currency values as a reason to visit Aspen, although the weak dollar is a bonus for many European travelers this winter. For some, however, it’s the other way around.”In absolute terms it’s very, very expensive for us to come here,” said Marchetti. “But it’s worth it.”Just the factsIn the sales office of the Silvertree Hotel in Snowmass, a world map with various colored pushpins indicates each time an international sale is made. There are also clocks indicating the time in Sao Paolo and London, among other far-flung locations. Both symbolize the importance of international sales for the Silvertree, Snowmass’ only major hotel. “We’re forecasting 30 percent more international guests than we had all of last winter,” the Silvertree’s John Quigley said in early February. “We’re pleased with our results in the international market, and we’re going to continue next year.”Hotels, restaurateurs, the Aspen Skiing Co. and many local businesses like international visitors because they tend to stay longer than their rushed, overworked American counterparts. And the longer they stay, the more money they spend.Also, a smattering of guests from around the globe adds to the area’s cosmopolitan flair, and “it adds a dimension to the overall guest experience,” said Quigley. “It energizes everyone to hear the different accents, to be part of an international community.”International sales account for 15 to 20 percent of the Skico’s business, and by all accounts international visits in general are strong this year.”We’ve been setting every record in the book for international sales,” Stay Aspen/Snowmass President Bill Tomcich said earlier this winter. SAS is a central reservations agency that books into numerous properties in Aspen and Snowmass. Some international markets, particularly South American ones, have become particularly strong in recent years. In fact, Brazil and Argentina are the top two markets for Stay/Aspen Snowmass, followed by Spain, Mexico and the United Kingdom. For the Skico, the top international markets are Australia, the United Kingdom, Brazil, Germany, Mexico and Canada.”We’re seeing strong growth in all the international markets,” said Kris McKinnon, Skico’s international sales director.McKinnon, Tomcich and others who deal with international markets say that Aspen has, from its initial postwar rebirth as a ski resort, attracted visitors from around the world. For years, Aspen/Snowmass has been considered one of the top American destinations for international visitors. And it’s primarily the efforts of the Aspen/Snowmass International Alliance that keep it that way.Various properties pay dues to support the International Alliance, which operates a full-time international desk under the wing of Stay Aspen Snowmass. The desk sells packages that can include lodging, lift tickets, ski lessons, rentals and ground transportation. Members of the International Alliance travel together to visit their clients, mostly international tour operators, and work together on other marketing and sales efforts.”If you visit them and establish a relationship, they’ll want to stay with you,” explained Erin Peck, a salesperson at the Gant, an International Alliance member.